Lowdown: Life in WW2 Japan, told through the eyes of an ordinary Japanese girl. 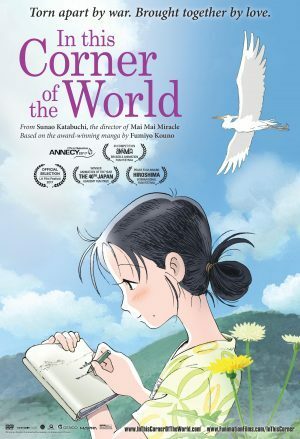 It is befitting to tell a Japanese story the Japanese way, and In This Corner of the World represents such a go. It is a touching tale of simple people growing up and living in Japan as it gets through World War 2, in which we get a taste for the culture of the time through things like how people got married, what they wore, and what they ate. As “expected”, the tale is delivered to us in anime form - the Japanese way. We follow the life of a simpleton, naive, yet good hearted girl growing up in Hiroshima. Like all of us, she has things she likes to do (drawing); like most of us, she can’t spend too much of her time doing the things she likes to do. What she does go through is a forced marriage and, in general, a life of much labour and toil, which she takes head on and fully accepts. Then there is the war. We don’t usually see what war is like on the losing side; "they" don't get to write the history books. Hence In This Corner of the World’s main contribution: it is not “just” another film. As one can expect, we see that war does tend to harm the innocent people on both sides. I will add, tough, that to this Western viewer it was hard to contrast the pictures of ordinary Japanese suffering through the war with the atrocities committed by the Japanese before and during the war, whether in places like China or Korea or in POW camps. Not that the film avoids them: there are very obvious references to brothels serving the soldiers. It's just that it is hard to see how those nice people the film portrays before us were able to commit those aforementioned atrocities. Overall: A nice tale that is made much more interesting through the events under its scope. 3.5 out of 5 crabs.